First held in 1926 and deemed ‘the most beautiful race in the world’, this famous race of classic cars begins in Brescia, passing through Desenzano on the route to Rome. If you’re staying in Desenzano while the race is taking place head to Brescia for the starting line, or check out the timetable and find a vantage point, where you can enjoy watching the cars go by. 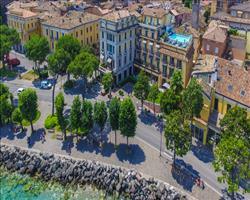 Desenzano is one of the towns that compete in Lake Garda’s annual Bisse regatta throughout the summer months. Bisse are long and narrow gondola-style boats, typical of Lake Garda, that are rowed by 4 standing oarsmen to compete for the Bandiera del Lago (Flag of the Lake). The finals take place in August with a flag ceremony and fantastic firework display. If you’re staying in Desenzano in June, July or August, keep an eye out for the race programme and head to the lakeside for a fun summer evening supporting your local team. Desenzano’s Night of Enchantment is an absolute feast for the eyes so if you’re staying in Lake Garda while it’s on; head to the Desenzano lakeside. The town is buzzing with a fantastic parade as well as music performances and dancing but the real spectacle is happening on the lake - boats are twinkling with of candles and thousands of floating candles are released onto the lake. It’s a magical and unforgettable event and concludes with a huge firework display. A trip to Verona during your Lake Garda holiday is a must if you want to visit one of the most famous Italian towns and there’s no better time to do this than during the Opera Festival. Arena di Verona’s opera festival has celebrated world class opera in a spectacular location since 1913 and has events from June to September. Big names including Andrea Bocelli, Josè Carreras and Plácido Domingo and ticket prices depend on seating (unreserved stone steps are the cheapest). Cento Miglia is Lake Garda’s most important sailing regatta, attracting crowds of sailors and spectators to Lake Garda every year in the first weekend of September. Established in 1951, it also holds the title of the longest running sailing competition in Italy. The world famous event sees hundreds of boats compete in a race around the lake, including some of sailing’s biggest names. Cento Miglia makes September a huge month on Lake Garda’s sailing calendar and adds a fantastic atmosphere to the lake.